Your wedding day is coming up and you are wondering if you should hire a bridal makeup artist. You have found your dream dress and the shoes and accessories that go with it. You spent months planning your bridesmaid’s outfits and all the details concerning the ceremony and reception. Do you really want to spend the extra money to employ a professional wedding makeup artist? Hiring a makup artist to apply your wedding day makeup will help complete your look. You spent a lot of time picking out the perfect dress and accessories. Bridal makeup artists are trained to not only find colours that look good on you, but to find a look that compliments the style of your wedding dress. If your dress is romantic, for example, you may opt for a softer look. If your dress is modern or unconventional, you’ll probably want a bridal makeup style that will fit the same description. Makeup artists also understand how different factors can affect your look such as lighting and how you appear in photographs. How many times have you seen pictures of brides whose makeup didn’t look quite right? Maybe they had dark spots under their eyes, or their skin tone looked uneven. Chances are, the person who did their bridal makeup didn’t understand how the colours they chose would come out on film. A trained bridal makeup artist takes these factors into account. Professionals also help you save time in the morning. On your wedding day, you may be excited, emotional, or too nervous to apply your own makeup. 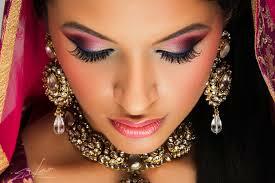 Having a professional makeup artist apply your wedding makeup is a good time for the bride to relax. Makeup artists also use professional products and techniques that will help your makeup stay fresh and beautiful throughout your special day. There are several advantages to hiring a bridal makeup artist for your wedding day. They will create a polished look that will compliment the style of your dress and your personal taste. Professional makeup artists understand how things like lighting and photography affect your makeup and will choose products and techniques that will enhance your bridal beauty. Also, they help eliminate stress and help you achieve the appropriate bridal makeup for your wedding ceremony. In addition their techniques create a look that will stay fresh and last throughout the day and evening. Be Gorgeous At 50 !! !